Well, you know, you win some, you lose some...and Dragon Magic, by Andre Norton (1972), sadly fell into the later category for me. The premise was interesting enough--four middle school boys of desperate backgrounds and interests all living in the same neighborhood in the early 1970s, but not interested in being friends. 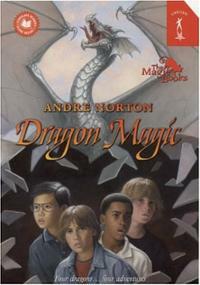 Then one of them discovers the magic of the beautiful dragon puzzle he finds in an old abandoned house--a puzzle with four dragons. Each boy in turn puts together a dragon, which whisks him on a journey back in time, and they become friends in the present when they share their experiences. Sig--ordinary guy of Germanic heritage, who finds himself helping Sigurd take on Fafnir. Ras, aka George--a black kid, whose big brother has embraced the Black Power movement, who finds himself a Nubian prince enslaved in Babylon along with Daniel. He gets to watch Daniel overcome an African swamp dragonish creature. Artie--would be cool boy, who goes back in time to King Arthur and learns a valuable lesson about meaningful relationships. Kim--adopted from Hong Kong, he goes back to ancient China where there is a very confusing war going on, and comes back knowing he should try harder to make friends. So a diverse cast of kids who don't get all that much page time, but who actually manage to be somewhat more than stereotypes, which is good, and four stories that varied a lot in interesting-ness, which wasn't so good. The first two (Sigurd and Daniel) were very interesting, the last two I found tedious. Which could have been just me. But the particulars of the stories aside, the whole ensemble never felt enough like a cohesive story to rise above the fractures of its form and make me really care. In large part this is because the time travel magic put the boys into characters in the past--they weren't themselves, so there was no ongoing metacommentary. The stories were told straight up,with no ties back to the present, in much the same way as you might find stories anthologized in a book of "Dragon Stories of Many Lands." And on top of that, the boys had almost no agency within their stories, which made them even less interesting. So that's generally why I didn't care for it. Here's a particular thing that vexed me--in Ras's story, Norton keeps referring to him as "the Nubian" and not by his name. All the other boys were referred to by name, and it bothered me that he was depersonalized this way. But the dragon puzzle was beautifully described...best dragon puzzle ever. I wondered about this book, since it was written by Andre Norton. But I think I'll skip it. I'm not going to try to persuade you otherwise! Sigh. 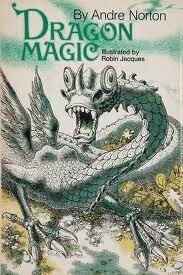 I have not read this in, oh a long time, but I remember liking it as a child. I was in it for the dragon puzzle myself. I can't think of another example of puzzle as portal to the past!